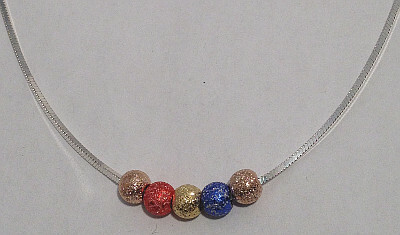 Bright colours 925 Glitter Balls Ladies Necklet in 16 inch length. All Sterling Silver Amazing Glitter Balls Necklace on square Snake style Chain. Eye Catching Coloured Red, Blue and Gold Glitter Ball Pendants on Sterling Silver fluid Snake Chain Necklace.